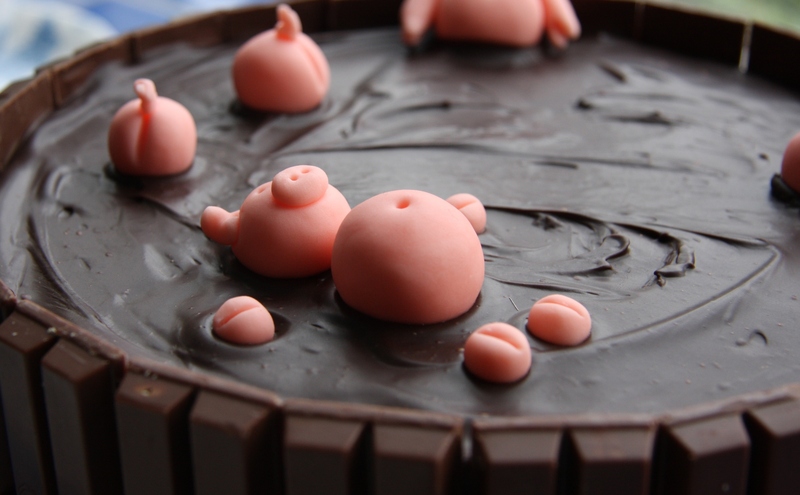 You may have already seen Pigs in Mud cakes online: they are very cute and much easier to make than you might think. I was asked to make one by one of the mums from school for her daughter’s birthday party: my initial reaction was that it would be too difficult! I have been thinking about setting up as a baker from home for a while now and as I have recently bought a house and am no longer renting, I really have no excuse not to give it a go properly. So instead of saying no immediately I looked online. And although I don’t know who came up with the original idea, I found this brilliant tutorial with instructions from start to finish. Judging by some of the photos you can find of these cakes posted by people online, I highly recommend checking out the tutorial if you would like to give it a try but haven’t made sugarpaste animals before! 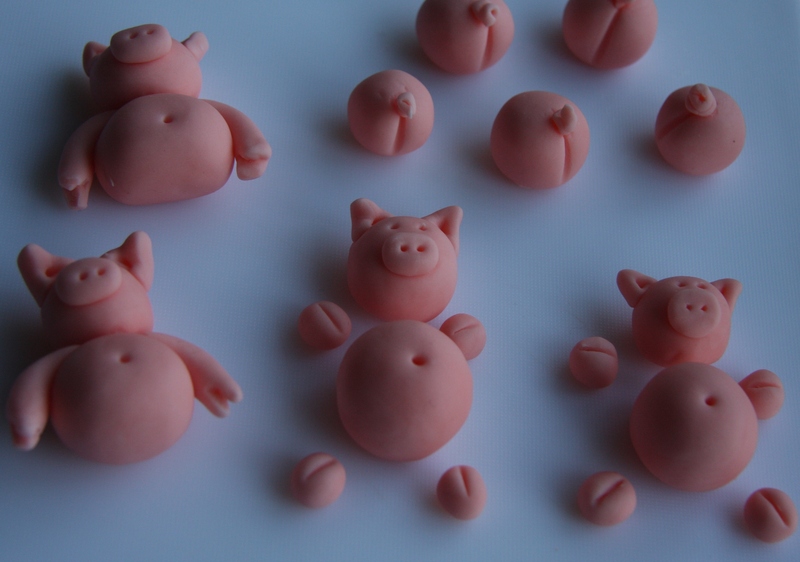 I followed the step-by-step instructions for making the pigs as I didn’t really know where to start with them. I was amazed at how easy they actually were and although they are a little time-consuming, they are really fun to make. 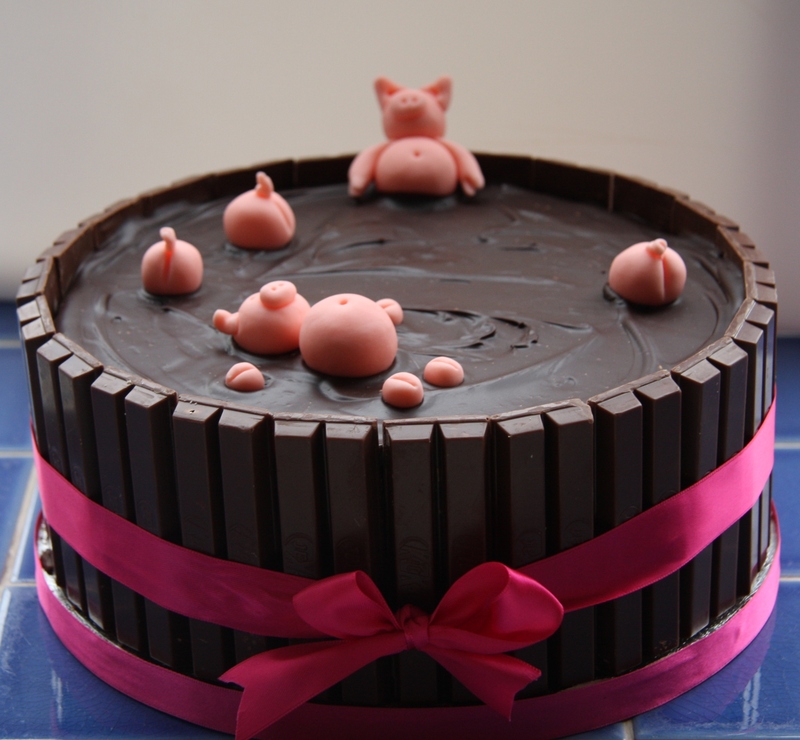 The tutorial even includes a recipe for a chocolate cake and the ganache for the mud bath on the top. I chose to make my usual chocolate Victoria sponge recipe instead (three layers) and filled it with chocolate buttercream, rather than the ganache that the tutorial recommends. I used more chocolate buttercream on the side to stick the kitkats on and only made half the recipe quantity of ganache for the top. 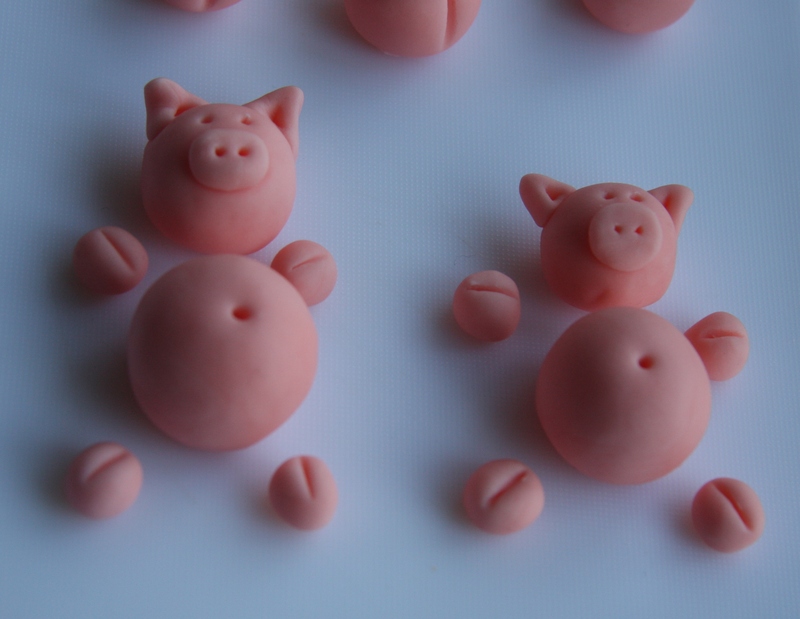 I made two sets of the pigs just in case they didn’t work out for some reason. How do you choose who makes it to the cake? There is even a plan for placing the pigs if you want to follow it exactly, which I did, or you could stage your own bathing pig scene. Maisie had seen the cake online and requested one the same so I tried to get it as similar as possible for her. I’m having some painting done in my house at the moment and the painters even asked if they could take a picture of my finished cake; something I am going to consider as a sign that it was a success! Happy Birthday Maisie, and thank you for trusting me to make your cake! Cake looks great! I’ve seen something along the same lines. Oops, can’t remember who. Anyway, good luck with setting up your baking from home idea. I’m in the process of trying to do something similar! Ouch. Thank you very much and good luck to you too! Oh my goodness-this is so adorable! Oh, that’s so cute! Quite chocolatey too! Yummy! Nice photos too. Looks delicious – well done! Not only did it look amazing, I was extremely fortunate to taste it and it tasted amazing. Another successful birthday cake for a happy girl. Love the name of this cake and how it looks! Gorgeous and adorable! It is definitely a success! That is so, so cute! I think I like your version the best of the ones I’ve seen. So clever and cute – you could set up a business selling these I am sure! 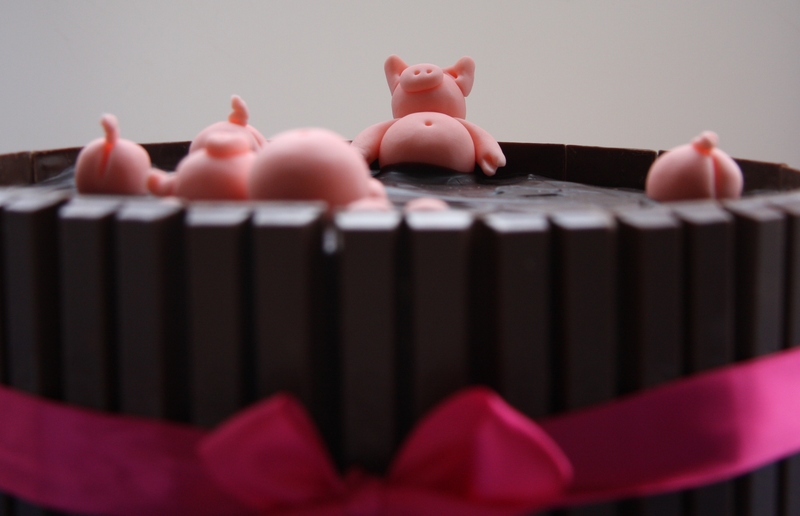 Love the pig cake and good luck with starting your own baking business! That’s really kind, thank you very much!! !